Definition of an optimist… "A person who thinks he can just afford to run a second-hand Aston Martin"
I’ve begun this piece with the above statement, nicked from a well known journalist not because it is necessarily true, but it always brings a smile to my face. Most of the visitors to this website do not own an Aston Martin – but at some time in the future, many wish to become ‘Members of one of the most exclusive clubs in the world’. I have written this straightforward guide for enthusiasts, very much like myself, with dreams bigger than their wallet. It should give you a very brief overview of the cars available but I cannot go into great detail about the pros and cons of each model. Now the biggest potential hurdle to Aston Martin ownership is the huge initial cost of these wonderful cars. A brand new Vanquish costs about the same as an average house in the UK making ownership of a factory fresh car feasible for only a very few wealthy people. So, many a first-time Aston Martin owner will have to start with a ‘previously owned’ example (I cannot bring myself to describe an Aston Martin as ‘second hand’). There is so much to know about Aston Martins before you part with your hard earned cash and this site should only be a starting point. I’m not a mechanic so don’t expect me to be able to give detailed advice on chassis condition, engines, problem areas, corrosion, servicing, parts, electronics etc – I’ll leave such things to the experts. But I hope that this short article will help to focus your mind on some important points you may find useful in preparation for that ultimate automotive purchase. Buying your first Aston Martin should be one of the greatest moments in your life; but getting it wrong could spell the end of a life-long dream. Thankfully with each successive Aston Martin purchase, the process becomes easier. Creating an Aston Martin collection can become both more costly and more addictive than illicit drugs, you have been warned. Since this page first appeared on this website in 2001, I have been overwhelmed by the interest that it has created and the numbers of visitors that have gone ahead and purchased an Aston Martin. Thankfully, a vast majority are incredibly well satisfied and feel that what I have written has been of great help. If, after reading this, you too are about to buy a car, please feel free to let me know. 1. Decide exactly the model that your looking for. Just wanting ‘an Aston Martin’ isn’t really enough. Pick an ear that interests you, pick a model, engine/transmission specification etc. and focus on that. I also think you need an idea of what colours you prefer. Colours can be model dependant, silver suits most AM’s, red works well on late 1980’s V8 Vantages, green is always popular although I don’t do green cars myself and in general, dark colours are popular on any model. There must be nothing worse than having a silver automatic DB6 when you really wanted a red 80’s V8 Vantage with a 5 speed box. Check the size of your garage. An AM V8 is a wide car with wide doors – you might get it through the door, but can you get out comfortably without damaging the car? And the V8 wedge Lagonda is not really that wide, but very long too – an especially large garage is essential. Most owners like to keep their AM garaged, certainly the coachbuilt models. Gaydon AM’s are a bit more resistant to the inclement weather. Cygnets aren’t fussed either way. If you live in a country that drives on the right, you will perhaps be wanting a left hand drive car. Generally, classic Aston Martins built with left hand drive are rarer and can cost at least 20% more than similar right hand drive examples. Many who live overseas choose to purchase a right hand drive car in the UK and import back to their home country. It is a viable option. But with more modern Aston Martins from the DB7 onwards, right hand drive cars are actually rarer. In some models, left hand drive outnumber right hand drive cars by 5 to 1. 2. Join the Aston Martin Owners Club www.amoc.org, get the register (an important document available to members only), read the magazines and meet up with as many owners as possible, even if you only do this using the web forum. It’s got a huge worldwide membership with 1,000’s of friendly and knowledgeable people (who have helped me to understand and enjoy Astons Martins so much more). I cannot recommend the AMOC web forum highly enough to you. With hundreds of members on-line from around the world, you will find great, sometimes conflicting advice and fellowship from people who have been there and sometimes paid the price too. 3. Read up on the sort of cars that you will be looking for. Get your hands on the books that cover the model and also any contemporary or recent road tests and magazine articles on your chosen model. If I can help you by sourcing a magazine article please let me know. 4. It’s always better to buy the car in the best condition that you can find. The cost of restoration or refurbishment is almost always greater than the difference between the purchase price of a poor car and a top draw example. Aston Martins are quite sophisticated cars needing specialist restoration skills – really it would be unwise to buy a restoration project for your first Aston Martin unless you have time, space, tools and experience on your side. Nowadays, DB4’s and DB5’s needing full restorations have sold for well in excess of £150,000, sometimes as much as £300,000 – unbelievable. Restoration case 1970’s AM V8’s, can appear quite cheap (see eBay!) but can need very extensive rebuilding costing tens of thousands of pounds. 5. I think originality is important. I even think that cars should only be repainted in their original factory colours. But Astons are a little like Vintage Bentleys – owners like to have things changed and modified to suit their personal tastes. Cars can be changed from auto to manual (and vice versa), engines uprated to ‘Vantage’ specification, left and right hand drive conversions and interior trim updated to a later model specification. Such cars never quite sell for as much as original well preserved examples but they might not necessarily be bad buys. It’s up to you to choose. The more history you can get like service records and invoices, the better able you’ll know the quality of any modifications. Anything done by the factory or well known specialists should be of high quality. It is vitally important that if your Aston Martin has been modified or updated from original factory specification, you will need to tell your insurance company to avoid a nasty shock when making a claim. Check through the history very carefully indeed. Cars with big gaps should cause a worry, however wonderful they appear. It is not unknown for DB’s to be rebuilt from only a few rusty chassis fragments and a chassis plate because of the good availability of parts for older cars . These cars can be very hard to spot but as they are often ‘as good as new’; Pebble Beach quality if you will. Are they genuine, original Aston Martins? – I’ll let you decide. 6. It is very important that before you part with your savings that you get the car properly inspected first and I don’t mean the AA or RAC. I have listed AM specialists in the links section who can help you with this. Having a report from someone who really knows Astons is very good for three reasons. If they find a serious fault, then you can walk away from the deal knowing that you have been saved from a time bomb of a car. If some less serious faults are found, this gives you some bargaining power with the seller (even it is being sold by a dealer!). Perhaps the problems can be fixed before the sale is completed or you can negotiate a lower price. I’m aware of an Aston buyer who got a 19% discount on the sticker price by using an effective inspection by an expert. If you do buy the car, you have a listing of future jobs that need to be attended to. But to this, I must also make a small note of caution. It is still possible for some faults to be missed – as one visitor has recently told me. Not all Aston Martins are the same and different models are best inspected by different people. If you would like me to make you an independent recommendation of a specialist, then please ask. I will also add that inspections tend to make worrying reading even for an excellent car. A thorough inspection will cover minor cosmetic issues or problems that do not need attending to immediately. Don’t look at a long list and get upset – ask which issues are essential and which are unimportant – and whatever the issue, it can be used to advantage in any negotiation. Cars sold by franchised AM dealers often come under the ‘AM approved’ scheme and could well be worth the small additional price premium for peace of mind. 7. Make an effort to see as many cars as you can, even if they are above what you can afford to pay. This will help you to understand why there can be such a wide variation in prices for the same model. The more cars you see, the more likely that you will find exactly what you are looking for. The very best cars are usually sold through specialist dealers (more expensive of course) and they can offer you a choice too. Private sellers are worth visiting especially if the car appears to be what you are looking for and it’s not to far to travel. Cars that have been owned for many years by AMOC members are especially well regarded. Auctions can be a source of good value cars but it is ‘Buyer Beware’. Some cars at auction may have been looking for new owners for a while and the owners is desperate to get rid – or it’s a bargain and the seller needs fast emergency cash. 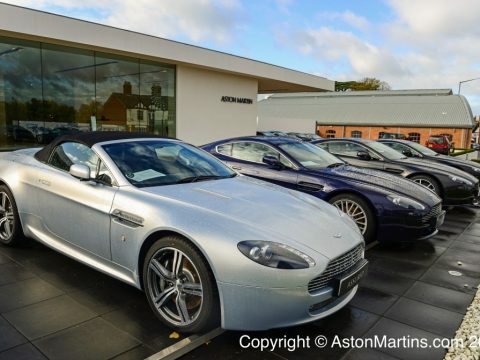 AML only auctions (annually by Bonhams at Aston Martin Works, Newport Pagnell) are an excellent place to buy a good value Aston, so long as you take someone with you to offer advice. Another time to see loads of cars in one place are AMOC Concours. I used to think that the very nicest, concours type cars virtually never came onto the market – and to an extent, I still believe this is true. But it isn’t necessary to buy the very best example, if you get a good car, you can slowly improve it to concours standard if that’s what you want. If you want a really top notch example, it’s upto you to create it and make it your own. I must add that if you are planning to drive a concours car that maintaining immaculate condition costs. You may be better to get the best car mechanically with a good, but not perfect level of interior trim. Bodywork should be as immaculate as possible always since it can be expensive to put right. 8. Never buy on a whim, never buy the first car that you see, and never ever buy a car that doesn’t have an Aston Martin engine. Occasionally you see cars with Jaguar V12’s and Chevy V8’s in the engine bay – they are not Aston Martins even if they look like they are! 9. As well as the initial purchase price, you have to work out what money you will need to run the car. Insurance for a classic Aston, even a 170 mph V8 Vantage X-pack, can be surprisingly cheap so long as it’s a limited mileage policy and you’re over 30. BUT the oil companies will love you if you own a thirsty old school V8 – especially if you live in the UK with our mega high fuel prices. Servicing and repairs will account for the biggest cost of Aston Martin ownership. It’s difficult to say what you will need to budget for but lets say an absolute minimum of £1000 would probably cover basic servicing for most models. But if anything needs putting right, it’ll cost much more. So budget for as much as you can. Try to keep upto date on both urgent and less urgent repairs and improve the general condition of the car. For classic Astons (pre DB7) a budget of £3000 is a sensible annual figure, £5000 is much better and should provide a buffer for potential big bills. I have a friend who keeps £10,000 available just in case something big goes wrong. Not surprisingly the DB7 i6 are probably the least expensive to service at the moment. But a nice classic Aston can save you money too. Depreciation generally is the biggest potential cost in motoring: buying a boring new car every three years or so can be a very expensive exercise. But the right classic Aston Martin should hold it’s value, so you won’t lose if you come to trade up to another model at sometime in the future. 10. If after reading the above, and you have realised that an Aston Martin is still outside your price range and income, then Don’t Give Up. If you would like to be sitting in here………. Here are a few models that I rate as good first Aston Martins. I’ve given my reasons for my choice but I’ve also tried to give some potential shortcomings of each model too.. When launched, Jeremy Clarkson famously tested the V12 Vantage is almost silence. The car must have made an incredibly deep impression. Clarkson predicted - correctly perhaps - that it was the final 'real' supercar. With its massive normally aspirated V12 engine mated to conventional manual gearbox, it appeals to enthusiasts. If you are considering something comfortable, cheap to run and easy to drive - walk away. With a production run of only 1200 examples, owners are reluctant to trade the V12 Vantage for a newer model. It you can find one, buy it and keep it forever. It's the last of the line. Why should you consider a DBS? It's far rarer than the similar DB9 with a production run of just over 2500 coupes. It's a genuine Bond car and in it's time, it was the most expensive, most powerful, top of the range model. Initially only available with manual transmission, by the time production ended, most were delivered with the automatic Touchtronic 2. If you can stretch to it, a manual DBS coupe is a car to keep. Now, before you think I've lost my mind, I'm not going to suggest that a Cygnet should be your first Aston. But how about a Cygnet as a daily driver and a V12 Vanquish for weekends. Lets say you have a V12 Vanquish but you cannot use it every day as it's impractical, thirsty and you only have limited mileage insurance. So what do you have as a daily driver? A previously owned Cygnet perhaps? Quite a few AM owners have seen the light. They are able to enjoy their favourite marque, save money and drive a stylish, comfortable yet extremely practice little car. OK, so Volantes always fetch far more than their hardtop equivalents, but this desirability keeps prices very firm. They appear to be virtually depreciation proof. Their high value tends to mean that they are well looked after. The V8 Volante is a truly beautiful car and whatever they cost, they are still way way cheaper than a DB4/5/6 Drophead. Now as Aston Martins go, the Virage coupe is quite plentiful. They sold very quickly at the very end of the 80’s and start of the 90’s yet demand dropped dramatically as the recession bit hard and demand has been slow ever since. Perhaps it’s the looks, an interior that has not aged well or a reputation for middling performance with less than optimum handling, but these £130,000 bespoke cars are now available for a fraction of this - a lot of car for so little money. Most are automatics and thus manual cars command a premium. Big car, fast, comfortable GT, huge road presence for a (relative) pittance. The Virage is now the cheapest entry level coachbuilt Aston Martin. And if you want more performance, you could always have it converted to a 6.3 litre. I personally rate the rarer Volante. Almost everyone who hankers after an AMV8 would mostly hanker after a Oscar India. The reasons are numerous, but they include restyled body, walnut interior with extra leather plus the overall quality of the cars was much improved. The problem is that really good ones don’t come to the market that often. Remember, Oscar India's are really quite desirable and nice ones tend to sell quickly. If you want an Aston without the potential problems of running a 'classic car' then you will not be surprised that the 6 cylinder DB7 is now very affordable both to buy and to run. Believe it or not, the early 94 and 95 cars are now regularly advertised at affordable prices - a bit of haggling by you could net a real supercar bargain! Volantes are only a little more expensive as they are only slightly rarer than the coupe. Autos and manuals were built in roughly equal numbers so you should be able to find a car that is just right for you. V12 Vantages are also now plentiful but I must warn you that V12 running costs are significantly higher than the i6. It is a very sophisticated car and very thirsty too. In production since 2004, the DB9 has the cornerstone of the range for over ten years. Glorious V12 engine with over 400 bhp for only a bit more than a DB7 Vantage. Plenty to choose from, although most are either silver, grey or black. Cars from AM main dealers are perhaps a little more expensive but are often the best examples. A great place to start your search would be https://used.astonmartin.com/. Getting close to the bottom of their depreciation curve?